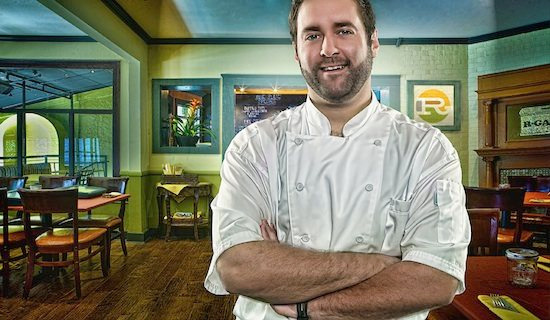 Known for its popular 6 days a week brunch and its craveable housemade tater tots, Hillcrest's R Gang Eatery is headed by the charismatic Top Chef Season 5 Alum, Richard Sweeney, and has gained critical acclaim for its unique take on classic comfort food. Dubbing his cuisine "Retro-American fare," Chef Sweeney takes familiar staples of culinary Americana and sophisticates and refines, while at the same time keeping his dishes accessible and welcoming. We recently stopped by R Gang for dinner and enjoyed the homey eatery as well as the comfort coma that followed. Located on Hillcrest's 'Restaurant Row,' R Gang Eatery has a spacious, covered front patio on 5th Avenue and a rather quaint and comfortable interior that boasts a full bar. R Gang's frequently modified menu oozes with nostalgia while at the same time offering lighthearted and inventive options. Boasting a full bar menu, R Gang offers an assortment of beers by the bottle, a hand picked wine list, and plenty of creative craft cocktails. From the famed variety of tots, we started with the signature cheddar and chive tots ($7.50), served with a mild chipotle ranch dipping sauce. Much girthier than store bought tots, Chef Rich's versions are crispy on the outside and maintain a creamy interior filled with the each of the definitive flavors offered. The crab and gruyere tots were reminiscent of a crunchy crab cake, and served with citrus avocado creme fraîche making for a tasty and satisfying starter. The tots are fun and delicious and understandably very popular. Sojourn to R Gang for happy hour when the tots are super inexpensive. Next we enjoyed the warm Brussels sprouts ($8) - flash fried Brussels sprouts tossed with crispy bacon in a warm mustard vinaigrette, then topped with parmesan cheese and drizzled with a rich balsamic syrup. 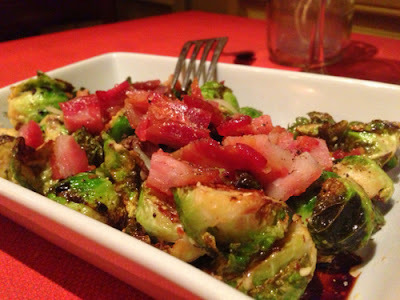 The bacon in this dish was super thin, almost like lunchmeat cuts, and combined with sprouts and the delicious marinade made for a wonderful compliment to any meal. This dish was definitely a favorite of ours! The next course of comfortable decadence was a pair of R Gang's macaroni and cheese concoctions that could have put us in a coma on its own. First up was the smoked gouda Mac 'n Cheese ($14.5) topped with toasted butter cracker crumb topping and mixed with the housemade meat loaf. We also sampled the new addition of provolone and bacon fusilli mac and cheese with bacon topped with crumpled potato chips. Fusilli was a surprisingly perfect pasta for such a dish allowing all of the gooeyness to sneak into the crevices of the corkscrew shaped pasta, and along with the creamy provolone cheese made for a pleasing option that can be customized as you wish. And here's a secret: although some options are listed, pretty much anything on the menu can be added to the mac for additional cost. Go nuts! For our main course, we first had the tuna noodle casserole (17.5) — an artful dish featuring potato chip encrusted seared ahi tuna on a bed of egg noodles in marsala cream sauce with mushrooms, peas and carrots, and finished with a drizzle of roasted sweet pepper coulis. This take on the classic dish was interesting and thoughtful. 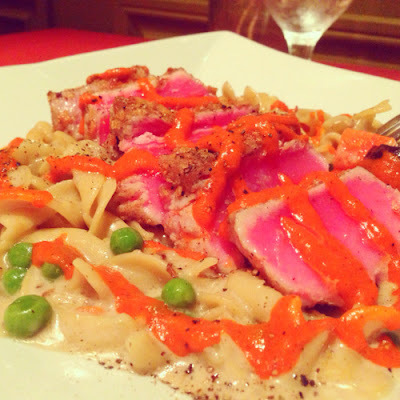 While combining the ahi atop the velvety pasta could be visually confusing, the tastes came together pleasantly and was a playful take on the classic dish. 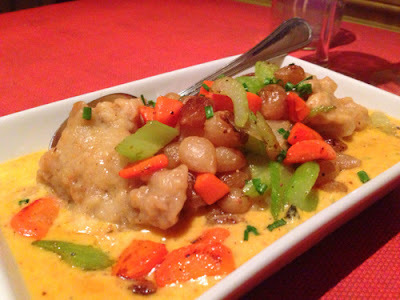 I couldn’t leave without trying Chef Rich’s chicken 'n dumplings (16.5). A favorite of mine growing up, I had been used to this dish in soup form, but R Gang’s version mixes braised chicken and buttermilk sweet potato dumplings in a sweet potato and sage gravy with caramelized pearl onions, celery, carrots, and topped with more chicken. The gravy was amazing and would be perfect for a sweet and savory Thanksgiving condiment, and the chicken was tender and moist. Unfortunately the dumplings were overly dense for my liking - taking away from our overall enjoyment of the dish. Sorry Rich, my mom still has my all time favorite chicken and dumplings. Keep working on it! Overall, we enjoyed the relaxed nature of R Gang despite the somewhat leisurely and spotty service, which shouldn’t be the case on a slow Tuesday night. We would definitely like to go back for brunch or happy hour, but with no beers on draft, making R Gang a regular spot for SanDiegoVille dining may not be in the stars. Embracing San Diego's craft beer scene has quickly become a prerequisite and while they do offer a nice selection of bottles, we definitely prefer tap beer when venturing out! For more information on R Gang Eatery, visit the website, and be sure to follow on Facebook and Twitter. And stay tune as R Gang's owner Rich Sweeney embarks on his latest venture, partnering with Tailgate and Good Time Design to open Tailgate Tap & Terrace in the former Wine Steals space at Petco Park.